Kawasaki Motors (Phils.) 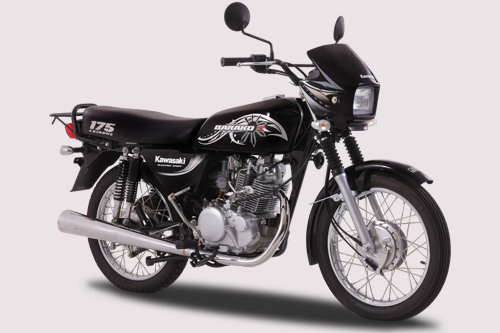 Corporation (KMPC) launched a motorcycle model which features a 175 CC Engine, the Barako II. There's a sun and three stars etched on the Gas Tank of the motor to mimic our national flag. The Barako II is equipped with a Kawasaki Automatic Compression Release System (KACR) which enables the rider to kick-start the engine with relative ease. It is powered by a 175 cc single-cylinder air cooled engine, promising to be 15 % more powerful than its predecessor. The four shock absorber of the Barako 2 is designed to handle heavy loads. It's dual seat is made by a polypropylene plastic. The Kawasaki Barako II sells at ₱ 77,400 (Kick Start) and ₱ 81,400 (Kick & Electric Start). Kawasaki Heavy Industries was established in 1896 by Shozo Kawasaki, whom the organization is named after. It has home office in Chuo-ku, Kobe and Minato, Tokyo in Japan. The organization is a worldwide producer of engine vehicles, for example, what is the price of this motors? I though Kawasaki is a name of a Japanese city. What electric bikes are the best available today? Come read the rundown of the main 10 electric bikes you can buy today. In case you're hoping to purchase an electric bike yet don't know which model to pick, you've gone to the correct spot. There are many options available to the burgeoning motorcycle riding enthusiast. There is help though. The following tips will help to point a beginner in the right direction. Hopefully you will come to enjoy motorcycle riding like so many other people in this world.